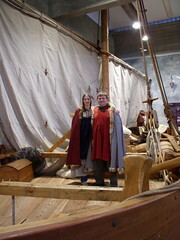 Image by Elaine and Tony via FlickrHere is the English version of the Viking Ship Museum website. There is a lot of excellent information here and a discussion of boat building in Viking times. Image via WikipediaThe International Association for Caribbean Archaeology (IACA) has released a DVD of all their Proceedings from 1961 to 2005. The papers are searchable and are in a PDF format (so all computers with the Adobe Reader can read them). The cost is $100. This will be invaluable to any institution or person that specializes in this fascinating area.